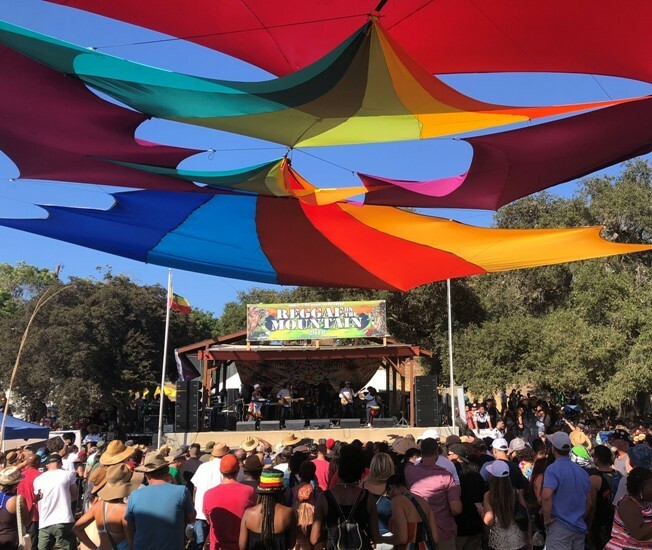 TOPANGA, CA – dBTechnologies was selected to power both stages at the Reggae on the Mountain festival at the Topanga Community Center. Tucked away from the hectic Los Angeles streets, a mere thirty miles outside of the city center, sit the rolling hills of Topanga Canyon, a scenic backdrop to the annual ‘Reggae on the Mountain’ festival. Founded nine years ago by the co-founders of Label 27, Brooks Ellis and Amit Gilad, Reggae on the Mountain celebrates the positive and unifying message of the genre while giving back to the Topanga Community Club. This year, dBTechnologies was selected to power both stages for the festival, which occurred July 14 and 15 at the Topanga Community Center. To ensure the best sound quality for such a unique space, the main stage featured five VIO L210s ground stacked per side, with a gradient array of seven VIO S318 subs. Each side of the stage featured an Ingenia IG3 and a DVA 1518 sub as sidefills, and the monitors consisted of two DVX DM12THs, six DVX DM12s, one DVA S1518 and one DVX 15HP. Additionally, the VIP area hosted two Ingenia IG1s, allowing VIP guests to enjoy crisp and clear sound. The second stage was flanked by two Ingenia IG3s per side, as well as two DVA S1518 subs.